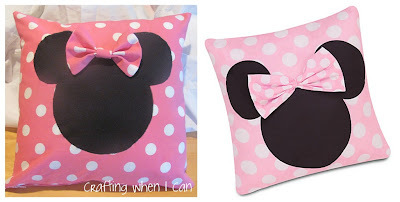 I saw the cutest Minnie Mouse pillow on DisneyStore.com last fall, and knew I could make my own - easily and for less $$$. When I thought about a gift our new baby could "give" her big sister, Annelise, I thought the pillow would be perfect! It was pretty easy to make (1 nap time) and if you add shipping to the original, I probably saved $10 (could have been more if I'd had a coupon, but in your last week of pregnancy, you can't wait around for a coupon). Cut two 15" squares for the pillow front and back (1/2" seams will be used throughout). I went to google images, typed "mickey mouse silhouette", and stretched it to fit an 8.5"x11" page. I like to use Lite Steam-a-Seam if I plan to sew around the edges or put it on clothing. Trace the mickey shape onto the paper backing that the sticky part is on (look between the two paper backing layers - it should be obvious). Peel off the non-sticky backing paper and iron the shape onto your solid black fabric. Cut right around the mickey shape, peel off the remaining paper backing, center on one of your 15" squares, and iron it down. I did a zig-zag stitch around the entire mickey shape. You could also just do a straight stitch near the edge. Since this is going in a toddler's room, I wanted it to be washable and durable. Pull the loose threads to the back and tie in a few knots for extra durability. Cut the fabric for your bows. You need a large rectangle that's 6"x8 1/2", and a smaller rectangle that's 3"x4". Fold the large rectangle in half with the short ends together and stitch around, leaving an opening on the bottom edge for turning. Fold the small rectangle lengthwise and stitch down the long edge, making a tube. Trim the seam on the tube to about 1/4". Clip the corners on the large piece, turn it right side out, press the raw edges in, and stitch a narrow seam on the open edge (not shown). Accordion fold the bow to your liking, and wrap the tube around the middle, folding in the raw edge about 1/2". (I ended up cutting about 1" off the tube - I just didn't need the full length to go around the bow.) Hand stitch the band, catching in some of the bow to keep it in place. Stitch the bow to the top of your mickey shape, making sure it's secure. Press down 1/2" on one edge of each pillow front and back (the bottom edge of the mickey shape piece). Stitch your zipper to each folded edge, centering the zipper. With zipper OPEN, line up the right sides of your pillow, pin around, then stitch, coming in about 1" around the corners on the zipper ends. Clip the corners, then turn right side out. Poke out the corners and press the edges. Insert your pillow form and zip it up. There you go! Go whip up a sweet pillow for a little girl you love who loves Minnie Mouse as much as Annelise does. This is REALLY cute! Great job on the pillow! Great job! Can't wait to try it and thanks for the tutorial. Thanks for this idea. My granddaughter loves Minnie Mouse.